My good friend, Linda, the editor over at Craft Gossip's Felt Blog, asked me to pass along the link for this amazing giveaway contest over there. Don't miss out on the opportunity to win a unique & beautiful felt brooch of your choice from Designed by Jane's Etsy shop. Head on over to Craft Gossip's post for all the details on how to enter and win! Seriously, who wouldn't want one of Jane's adorable felt brooches to dress up your bright summer dresses? C'mon! 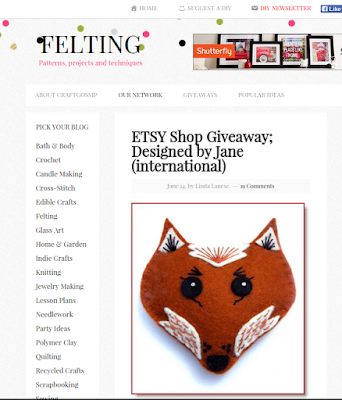 Click here to visit Craft Gossip's Felt Blog for contest details!